With a twinkle in his eye and a broom in his hand, Jerry leaned in and imparted to me words I may never forget. When I think about this last week a number of mental images come to mind. Most of them involve the sound of herding cats through prickly pear cactuses or re-written scenes from a Poe novel where helpless Americans are bricked into a wall using cotton balls, glue and paper-mache butterflies. Something about that age difference really put a barrier between our attempts at international relations long about two o’clock every day. I just don’t have as much energy as I used to. Even sweeping up the hallway with Jerry in the aftermath of the last day I could feel places in my back decaying with the swiftness of a wheel chair rolling down a hill in San Francisco without brakes. Anyone who has run a VBS understands that I’m using very little creative license here, but they also know I’m only highlighting the five percent of the week that felt like we were all falling into a meat grinder (seriously, the other ninety-five percent was amazing). If I had my way, we would have scheduled nap-times…for the teachers. Bright-eyed kids, little hands, big questions, home-packed sandwiches in plastic lunch pails – the best justification for submitting oneself to mental and physical torture for five consecutive days. The third and final week of our last American team’s trip and the second VBS of the summer, patience was hanging thread bare on our more emotional team members (obviously, I’m included in this group, if not the captain of it) and exhaustion was knocking at everyone’s door. I suppose it didn’t help that we were all getting sick. Every 48 hours a new wave of people would become chilled, tired and begin coughing with disturbing force. It felt a little like the Black Plague sweeping through the remnants of our community walled up in the missionaries’ home. Those difficulties aside, certain team members went above and beyond the call of duty during the week. Eating lunch with the children and learning how to say things like, “You are a squirrel,” or “He looks like an eggplant” in Czech are a given at a VBS in a foreign country. Any team member worth their salt will do that. Or will sit and make play-dough shapes upon request or have dum-dums ready for emotional emergencies. These are basic. Above and beyond means you come so prepared with so much awesomeness that VBS literally explodes and happiness, rainbows and children get mushroom-clouded into the air. 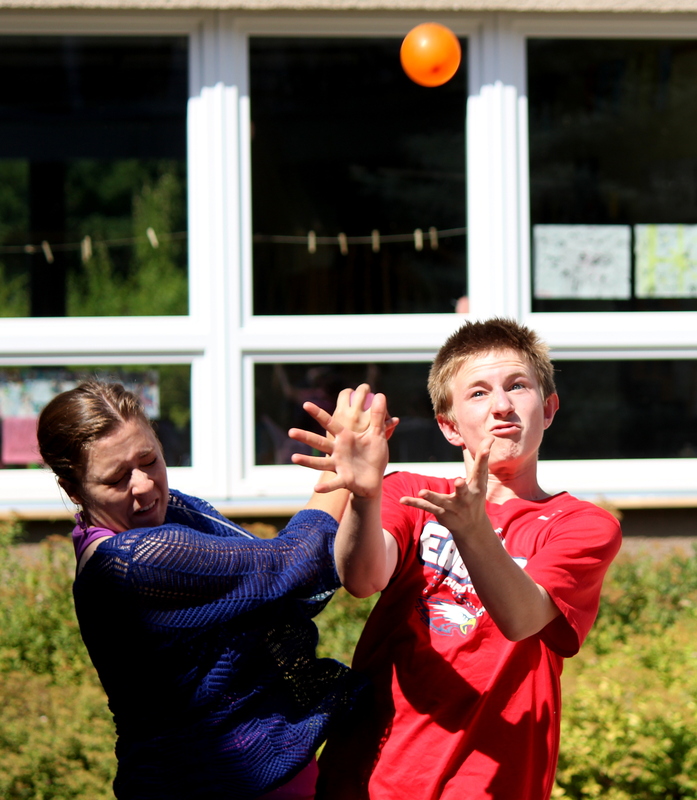 This is what David did when he brought enough water balloons to arm both sides of the Bolshevik Revolution. Joseph getting soaked in defeat. Let me say now that Eastern Europe (“We’re not Eastern Europe,” Autumn corrects me. “We’re Central Europe.”) has been baking under something awful, to the point where the weather has become so unbearably hot most Czech men have stopped wearing shirts in public. The women frequently ride bikes or take walks around town in their bathing suits and children within 20 yards of water will likely not be wearing clothes at all. It’s been hot here, guys. Water balloon disaster in the making. Happy they were to throw things at people, and happy they were to come marching back inside drenched to the bone. And happy we were to let them be happy. We did have several long conversations about God’s plan and what it means to be a Christian. We made crafts and ate fruit snacks. But we also threw balloons and made a mess and for 45 minutes every day we were all the same age. That was the best part. 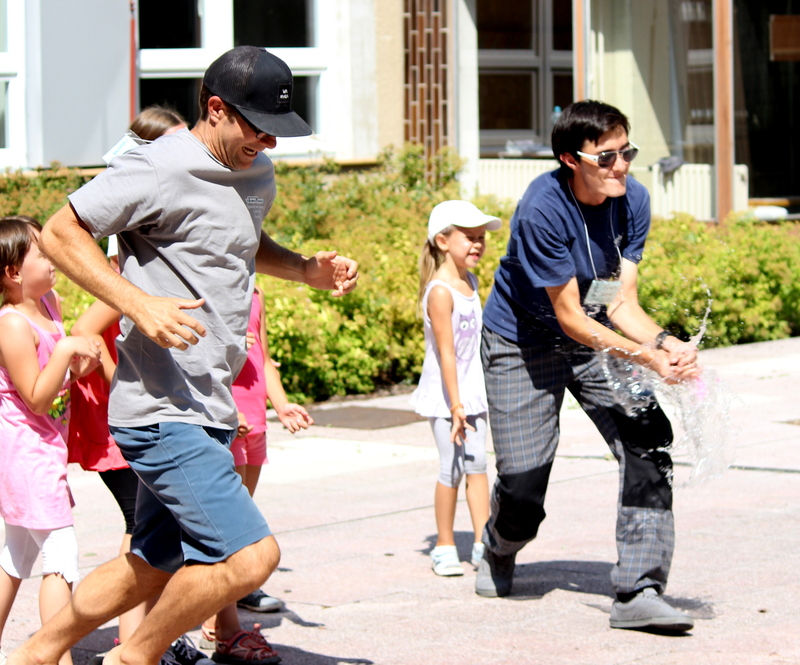 Americans get hit with water balloons as Czech children dance (literally break down) with delight. This entry was tagged children, Eastern Europe, Shopping, United States, Vacation Bible School, Water balloon. Bookmark the permalink.